As if playing clarinet wasn’t already difficult enough (reeds, breathing, coordinating both hands) we also have to worry about tuning. Tuning (also known as intonation) is more than just aiming for the green light on the tuner. Tuning is a complex science with different variables specific to each instrument. The most frustrating part? You must constantly listen and make adjustments – tuning isn’t something you can do on auto-pilot. Let’s start with the basics. What is tuning? Tuning is the adjustment of musical pitches to match a reference. The reference can be a variety of things, including frequency level (A=440 Hz in the United States), or other musicians with whom you are playing. Without getting too scientific, A=440Hz means that concert pitch A above middle C will have 440 vibrations per second if it is in tune. If you are out of tune, you are either too high (sharp) or too low (flat). The unit of measurement to indicate how flat or sharp you are is called “cents.” The more out of tune you are, the larger the cents. For example, 20 cents sharp is higher (aka more out of tune) than 10 cents sharp. So how do you tune a clarinet? (*insert dorky band joke punchline here*) Essentially, you adjust the length of the tube (aka clarinet) to match your reference. The shorter the length of your tube, the sharper you will be (shorter=sharper). The longer the length of your tube, the flatter you will be (longer=lower). Think of a piccolo and a tuba – the shorter instrument is much higher, and the longer instrument is much lower. How do you make tuning adjustments on the clarinet? If you are sharp, pull out. If you are flat, push in. Most musicians make these adjustments between the barrel and upper joint, but you can also adjust between the upper and lower joint or the lower joint and the bell. If you find yourself having to pull out or push in too far, there could be a problem with your instrument or you might consider purchasing a different mouthpiece or barrel (more on this below). So, what are some good tuning notes on clarinet? This answer may be more divisive than Alabama vs. Auburn football, but here’s my two cents (sorry for my terrible tuning pun): low C, open G, and top line F are my picks. Find two or three trustworthy notes on your clarinet, and play them with a tuner. 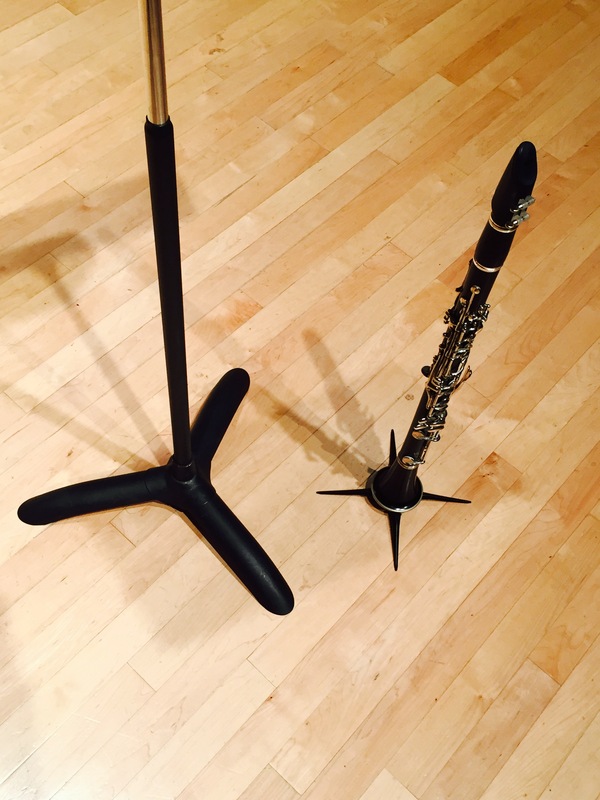 Tuning tip: Remember that no instrument will be perfectly in tune, and the clarinet is no exception. Some notes on clarinets are more out of tune than others, and these notes can change with clarinet make and model. For example, high C# is a sharp note and low F is a flat note on all clarinets, so don’t assume you are playing a bad clarinet. It is important to learn the tuning tendencies of your instrument so that you can make educated tuning decisions. Observe the general tuning tendency of your tuning notes – are they all sharp? All flat? Now it’s time to make adjustments. Pull out or push in, and play your tuning notes again to see if the problem is corrected. Tuning tip: Only make adjustments to your clarinet based on your trustworthy tuning notes. You should not be constantly adjusting the length of your tube for each note that is out of tune. This is impractical and also affects the tuning of notes which might have previously been in tune. This is another reason that it is important to learn the clarinet’s tuning tendencies and the factors listed below. After you have tuned, use a tuner as a reference and use your ears to listen to your intonation as you practice or perform. When playing with other musicians, listen and make adjustments constantly as you play to match the other musicians as closely as possible. Tuning tip: Tuning changes constantly, so the tuning adjustments you made yesterday (or even an hour ago) will not necessarily be accurate in the present or the future. Many band directors wrongly teach students to always keep their barrel pulled out the same amount every time they play, and this is inaccurate because tuning constantly changes. Now that you know the basics, let’s discuss a few factors and how they affect clarinet tuning. The closer your fingers to the tone holes, the lower the pitch. The further your fingers from the tone holes, the higher the pitch. For example, low A is generally high, so you can keep your right hand ring finger closer to the tone hole to lower the pitch (just be careful not to actually touch the key). Different mouthpieces are tuned differently. For example, the Vandoren 13 series mouthpieces are tuned to A=440Hz, but Vandoren traditional mouthpieces are tuned to A=442Hz. Choose your equipment according to your tuning tendencies and ensemble requirements. Most clarinet barrels in the United States are 65mm or 66mm, but you might need additional lengths depending on the ensemble you perform with or other factors. Familiarize yourself with these elements which affect clarinet tuning and learn how to use these for your musical advantage. For example, blow warm air into your clarinet if you are waiting in a cold greenroom before performing under warm stage lights. Avoid extreme dynamics in any registers with problem notes. Acquire a selection of barrels to adapt to any tuning situation. Tuning is difficult enough, so learn as much as you can about your personal tuning tendencies to quickly adapt to any musical situation. Now that you know some factors which can affect clarinet tuning, make sure that you’re not guilty of any of the following sneaky tuning saboteurs! Playing with the bell in your knees makes notes lower because it stifles the air flow. This is especially true for middle B. Taking a breath before a sharp note. Any time you breathe, the next attack will always be slightly sharper than if you had not breathed. Avoid breathing before any notes that are already sharp, such as high C#. Relying only on a tuner. A tuner is a great way to learn your tuning tendencies, but you should always rely on your ears to hear and adapt according to the musical situation. Use a tuner as a guide, but remember that even if you are in tune with the tuner, this does not mean that you are “right” or that you will be in tune with other musicians. Ignoring your role in the chord. For more advanced players, tuning will change according to what part of a chord you have in an ensemble. Examples: the tonic should always be in tune, the 3rd slightly low, and the 5th slightly high. Playing for extended amounts of time. The longer you play the clarinet, the sharper you get. This is because you have been blowing hot air through the tube (temperature), potential softening of the reed (reed strength), over-tightening the embouchure (embouchure pressure), and general fatigue which inhibits concentrated listening and adjusting. Ignoring tuning when you play solo music. Just because you do not have to tune to other musicians does not mean that you do not have to tune. When playing alone, check the tuning to make sure that no notes stick out and that your intervals are even. Dropping your jaw. It pains me when I hear educators tell clarinetists to drop or lower their jaw to adjust pitch. This disrupts the embouchure, which provides stability as the foundation for playing clarinet. There are better ways to make tuning adjustments (as discussed above) without vastly altering your embouchure. Not hearing the notes in your head before you play them. Learn from your fellow singers and brass friends – always hear the note in your head before you play it to make the tuning as accurate as possible. Mentally preparing for and voicing the notes is an easy way to improve your intonation. And there you have it – a comprehensive guide to clarinet tuning! Tuning is a never-ending musical journey, so be patient, use your ears, and good luck! not really a clarinetist myself but enjoy dabbling..
then was needed briefly in a show and was surprised to find myself almost half a tone flat..
only just occurred to me that the barrel might be wrong and not all just my poor embouchure..